A pair of football boots worn by Sir Stanley Matthews in the 1953 FA Cup final have been sold at auction for £38,400. The boots went under the hammer at auctioneers Bonhams, in Chester. They were expected to fetch about £8,000. The football legend helped Blackpool to a 4-3 victory over Bolton Wanderers in the 1953 final. 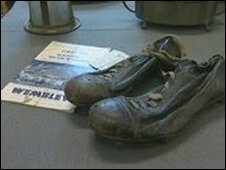 He gave the boots to one of his fans, Wilf Coomer, after the historic match and they were unearthed recently. Dan Davies, sports consultant at Bonhams, said: "I'd previously said I would be delighted if they fetched £10,000. I didn't expect them to go for so much. "We do get these surprises now and again though." He said he was not able to divulge any information about the buyer. One of the most famous players of his generation, Sir Stanley represented his country 54 times. He became the first player to be knighted in 1964. He died in 2000 aged 85. Sir Stanley's daughter, Jean Gough from Stoke, said: "I am absolutely stunned. That's fantastic. "It is quite a tribute to my dad that someone would pay so much. "I just hope whoever bought them might think of putting them in the football museum. She added: "They were special boots. He had them specially made. They were very light so he could have that extra speed to go up the wing."